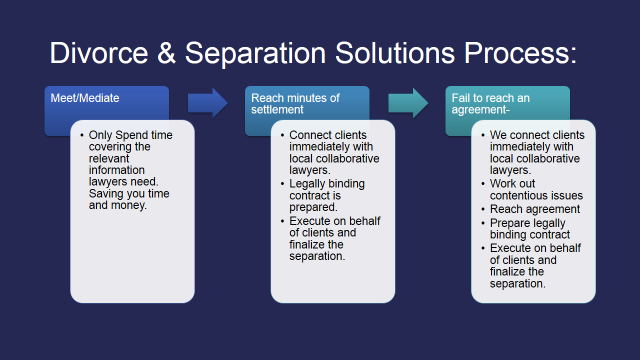 This “get to know you meeting” will provide the two of you with an opportunity to learn more about Divorce & Separation Solutions Inc., how we propose to help you and the procedures that we will employ for that purpose, and how this differs from other approaches. Most important, it will enable you to meet with the mediator with whom you will be working to see whether you feel comfortable with him. Finally, it will give you an opportunity to ask whatever questions you have. 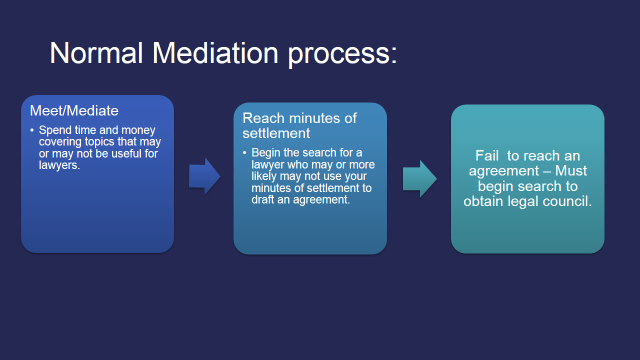 Since every couple’s circumstances differ, this meeting will give your mediator the opportunity to understand the types of issues involved in your particular situation so that he can give you a more accurate estimate of how long the process will take and how much it will cost. Please be assured that this “get to know you meeting” is simply a way for you and your spouse to obtain more information about Divorce & Separation Solutions Inc., and there is no cost or obligation of any kind on your part. We do require that the two of you attend this meeting together, since your mediator will be working with both of you throughout the entire process. Please call Divorce & Separation Solutions Inc. to schedule a free consultation for you and your spouse at your convenience, either in the morning, afternoon or evening.